The US congress is particularly interested in virtual worlds. 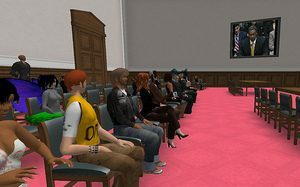 Last Tuesday, the US congress experienced its first Congressional hearing session held simultaneously in real and in a virtual world. Congressmen represented by avatars, were interested in what can be done within virtual worlds, the importance of the impact on the economy and the possible risks including those on security. The hearing was conducted by the Subcommittee on Telecommunications and the Internet (a subcommittee of the House Committee on Energy and Commerce). Congressmen noticed a range of actions informed by vision and clarity of purpose. One of the most needed actions from the Congress is programs that will spur the technical development of the 3D Internet.